Budget Promises: Beyond Parliament is Sri Lanka’s pioneering budget monitoring platform. It tracks the government’s performance and openness on key promises made in its annual budget. The platform is motivated by two basic questions: (1) Is the government doing what it is saying? and (2) Is it saying what it is doing? In 2018, the platform is tracking 38 budget promises amounting to LKR 149,350 million, which accounts for 82% of all new expenditure proposals in the 2018 Budget Speech. 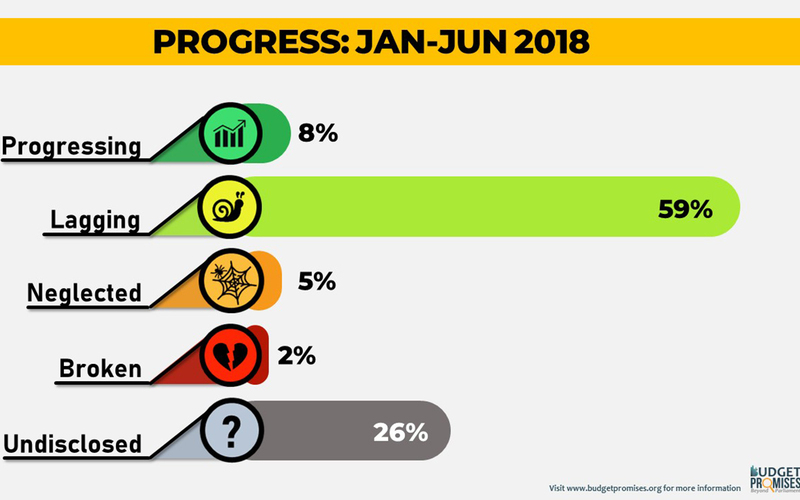 At the end of the first six months of 2018, the pace of progress is slow – only 8% of promises are progressing in line with their targets. Further, progress on 33% of proposals are categorised as either broken, neglected or undisclosed. This means that the government is either not doing what it is saying or not saying what it is doing for promises amounting to LKR 60,200 million. The bulk of new expenditure proposals in the 2018 budget (59%) are categorised as lagging in terms of their implementation. While the government’s progress in implementing its budget promises remains stagnant, its willingness to disclose this information has declined. In the first half of 2018, information on progress for 74% of the tracked promises was either not available or obtained with difficulty. In nearly 60% of the promises being tracked, government institutions failed to provide the action plan or progress report in response to a request filed under the RTI Act. Further, only 33% of progress reports could be compared against the action plans received. In the 2018 Budget Speech, the Minister of Finance announced that an implementation unit would be set up under the ministry to monitor the execution of the proposals in the speech. However, in response to an RTI request, the Ministry of Finance claimed that such a unit does not exist. Yet, in another response, this statement was contradicted by the same ministry. These weaknesses in information disclosure and implementation of budget promises suggests (1) the budget being implemented is inconsistent with the one declared to Parliament; and (2) the government is not fully aware of how public funds are spent. For the period January – December 2017, 8% of promises tracked by Budget Promises: Beyond Parliament from the 2017 Budget Speech were categorised as fulfilled.